We often learn about our American ancestors in ten-year intervals from the federal census. To that timeline we add milestones like births, religious rites, graduations, marriages, property purchases and deaths as we learn about them. But we're still left with gaps in our knowledge of the year-to-year lives that our relatives lived. This is why we use city directories. These published annual listings of a city's residents often contain much more information than the telephone books that eventually replaced them. They may include an ancestor's address, employment, household composition, rental/owner status and more. You can learn about nearby businesses, churches and schools; neighborhood demographics and even local history. Direct your attention to city directories, and soon you'll eliminate some gaps in your family history. The earliest known U.S. directory was a manuscript list of New Yorkers in 1665. Baltimore had a directory in 1752, but it doesn't appear to have circulated. The first standalone, published city directory appeared in 1785 in Philadelphia. Then the concept caught on quickly. Within a year, New York City had its first published directory, and by 1800, Boston, Baltimore, and Hartford had them, too. Most major American cities had annual directories by the mid-to-late 1800s, and smaller towns somewhat later. 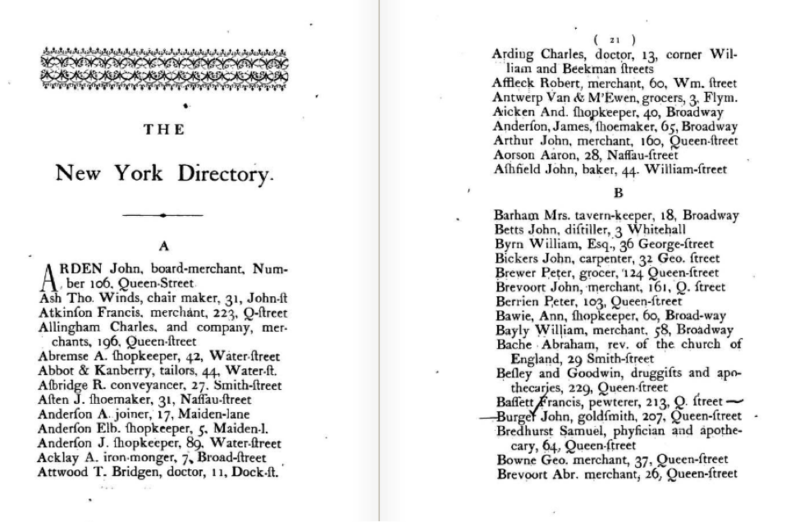 The New-York Directory, by David Carroll Franks, 1786, reprinted 1874 by FB Patterson. Image accessed at Internet Archive.org. City directories were meant to help businesspeople find customers, initially defined as other businesses and individuals with spending power. By the mid-1800s, most free men and some widows were listed. Renters were included. By one estimate, about 20% of a large city's total population appeared in nineteenth-century city directories. By the end of the 1800s, directories began listing more female residents, particularly employed women (who, with an independent income, were potential customers). Sometimes wives were listed after a husband's name. In the early 1900s, it became more common to see university or trade school students listed, too. City directories began to disappear during the 1910s-1920s, though some lasted as late as the 1960s. Telephone books, which began appearing in the 1870s, gradually took the place of city directories. In some cities and years, you may find both types of directories were printed. When you find a city directory, you're likely going to turn right to the alphabetic listing for an ancestor's name. That listing may be packed with great information. A listing itself confirms that a person lived there that year. You'll often find occupations listed (in fact, you may see two listings for one person, one at home and one on-the-job, if enumerators found them both places.) Other household members may appear, adding information about spouses, boarders or the like. You may see an "r," indicating renters. Other families of the same surname may be listed--possible relatives. The address may lead you to previously-undiscovered census returns, property records and Sanford or other maps. Here's an example of how city directories can fill the gaps in our knowledge. I had been unable to determine what my husband's grandmother, Marie Rose O'Hotnicky, did between high school graduation in Olyphant, Pennsylvania in the late 1930s and her 1945 marriage. A second cousin said she went to Harrisburg to live with her brother. I found Harrisburg city directories for the 1940s on Ancestry.com, and there she is listed in 1940, 1941, 1942, 1943 and 1945. The image below comes from the 1943 directory. It shows her living in the same apartment as her brother William and sister-in-law Margaret. There's also another listing for her at work as a checker at White Mountain Cleaners. Mystery solved; gap closed. Reverse listings, or cross-listings by address. These can help you locate neighbors and nearby churches, schools, businesses and cemeteries. Neighborhood demographics. Does the directory contain pages of Irish or Chinese surnames? Do you see a lot of miners or mill workers? What are working women doing--factory jobs? Taking in boarders? Employer listings. See if an ancestor's employer is listed. How far was your relative's commute to work? What type of work was it? Does the employer have any ads in the directory? Unique features that may change from year to year: neighborhood maps, local histories, lists of residents moved in/out, mortality lists for the year prior, railway or sunrise/sunset schedules, rosters of honored students. Advertisements. What products or services were touted on the pages? Some publishers created separate business, social and professional directories. If your ancestor owned a business or was of a professional service class like a doctor or lawyer, it's worth looking for these kinds of directories. In older cities and in some Southern cities, social registers or "blue books" were also published beginning around the 1880s. These listed the social elite, mostly "old money," so most of our ancestors will not appear here. But isn't it worth seeing whether great-granddaddy made the "eligible bachelors" section of the Denver social register? Social and business directories may shed light on the gap between the daily lives of your ancestor and his or her employer (or even former master). Finding city directories has gotten easier over the years, but you need to know what you're looking for and where to look. Often in the early years, publication was sporadic. There may be a directory in 1820, but not again until 1835, and then a gradual appearance of annual volumes. You may find gaps during the Civil War, World War I or World War II, when directories were not published. The Allen County Public Library, the Family History Library, and the Library of Congress are the three largest repositories of city directories in North America. The Genealogy Center of the Allen County Public Library has over 56,000 city directories in print/book form and almost 11,000 microfilm rolls of city directories. Rounding out their collection is a set of microfiche directories covering 240 cities for the years 1785-1860. City Directories of the United States, 1860-1901: Guide to the Microfilm Collection is a printed guide and is available at major libraries. Remember that directories for a large city may or may not include that outlying borough you care about. Genealogical and historical societies and archives often have city directories: call them or check their holdings on their websites. Look in local history and genealogy sections or in special collections at libraries. Many directories have been digitized: the Akron-Summit County (Ohio) Public Library has over a century's worth for its area (1859-1969); the Pikes Peak Genealogical Society has a run of Colorado Springs directories (1879-1922). Finally, check the huge collection U.S. City Directories, 1821-1989 (Beta) on Ancestry.com. You can search over a billion records by name or browse directories in every state except Alaska. This is a good place to look for someone (especially with an unusual name) if you're not sure where he or she is in a given year, because you can search many directories at a time. Direct your attention here or any of the other places you might find city directories, and soon you'll have a more direct understanding of your ancestor's life.